BARCELONA: Around one million people rallied in Barcelona on Tuesday, banging drums and blowing whistles in a show of support for Catalan independence nearly a year after a failed attempt to break away from Spain. 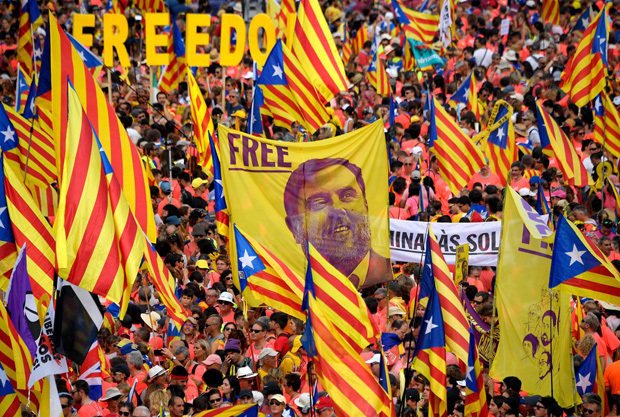 Wearing coral-red T-shirts and waving the red, yellow and blue Catalan separatist flag, a sea of protesters gathered for the rally on Catalonia’s ‘national day’ which commemorates Barcelona’s fall to troops loyal to Spain’s King Philip V in 1714. The annual ‘Diada’ holiday has since 2012 been used to stage a massive rally calling for secession for the wealthy northeastern region that has its own distinct language. But this year’s event had particular significance as a test of strength after a referendum last Oct 1 deemed illegal by the courts, and the Catalan parliament’s unilateral declaration of independence on Oct 27, all came to naught. Demonstrators climbed on each other’s shoulders to form human towers, a Catalan tradition, while others carried yellow and black signs that read “Free Catalan political prisoners now”, a reference to Catalan separatist leaders in jail awaiting trial over last year’s independence bid. Organisers said they had sold more than 200,000 coral-red T-shirts – the colour used in the ties used to secure the ballot boxes during last year’s contested referendum. Opposition parties complain that separatists have transformed the “Diada” into a holiday which excludes the half of the Catalan population that does not favour independence. A closely-watched Catalan government poll in July showed 46.7 per cent of Catalans want an independent state, just ahead of 44.9 per cent who were opposed. Separatist parties won a slim majority of seats in the Catalan parliament in a December election, even though they captured just 47.5 per cent of the popular vote. “If a separatist is so naive or stupid to believe he can impose independence on the 50 per cent of Catalans who are not (separatists), it’s clear that they are mistaken,” Joan Tarda, a lawmaker for separatist party ERC in the Spanish parliament, said last week. The ERC has a taken softer approach than its ally in the regional government – former Catalan president Carles Puigdemont’s Together for Catalonia.